October 7, 1994, Greencastle, Ind. - Lynne Cheney believes that being politically correct is not the correct thing to do. "Our colleges and universities should be about pursuing truth, not agendas," Cheney, former chairman of the National Endowment for the Humanities, said at a DePauw University convocation this morning. "Political correctness inhibits thought. It is imperative that we get beyond that," she added. 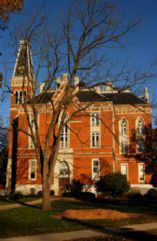 Cheney's address, presented by the Timothy and Sharon Ubben Lecture Series, took place in Meharry Hall of historic East College. Cheney also conducted an informal question-and-answer session with the public in the afternoon at the F.W. Olin Biological Sciences Building. Cheney chaired the National Endowment for the Humanities from 1986 to 1993. The Endowment is an independent federal agency that supports education, research, preservation and public programs in the humanities. During her term, she emphasized the importance of educational programs for the public. The most famous public program supported by the Endowment during her tenure was the Ken Burns television series, The Civil War. She also is a champion of school choice and national standards to measure student achievements. She believes that values must provide a necessary foundation for learning. "If we want our children to think that honesty and hard work matter, we must tell them why these ideas are important," she says. "Now, in many cases, we're giving them the opposite message -- and, unfortunately, they are listening." She also stresses the need to reaffirm that there are values all Americans share, regardless of race or gender. She says the United States is a different country. "Many countries have defined themselves ethnically, but we have historically defined ourselves by a set of common ideas and ideals," Cheney says. "But in recent years," she says, "emphasis is all too often on what separates us rather than what binds us together. "Anyone who doubts the danger of this approach need only look at countries -- such as the former Yugoslavia -- that have put ethnicity above everything else," she warns. 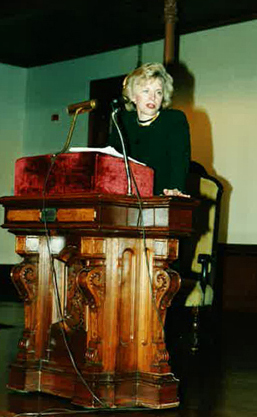 Lynne Cheney is a novelist and widely published author. She is currently the W.H. Brady Jr. Distinguished Fellow at the American Enterprise Institute in Washington, D.C. Cheney's opinion pieces have appeared in numerous publications, including the New York Times, Washington Post and Wall Street Journal. She frequently appears on national television programs, including all three network morning news shows. Endowed by Timothy and Sharon Ubben, both 1958 graduates of DePauw, the Ubben Lecture Series is designed to bring the world's top leaders, thinkers and creative minds to the Greencastle campus. See a list of all Ubben Lecturers by clicking here.